5 minutes walk to Ueno Ameyoko shotengai. There are many restaurants and Japanese style bars. Good for business trip and family trip!! 10:00-11:00 Japanese beauty makeover at Waso Koubo【Miyabi】where about 3 min walk away from the hotel! 11:00-12:00 Visit Shinobazunoike Bentendo Temple, Gojoten Shrine. 14:00-15:00 Take a walk to Toshogu, Relax at fountain square. 15:00-16:00 Check in at the hotel. 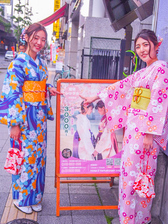 Rental Kimono is unlimited use during service hours, so recommend dressing up in the morning. It will take about 15min to dress up for one person. Reservation must be designate every 30min in time zone. ・Kimono for male is also available. ・This is special plan for guests who stay one night(No night consecutive) and Japanese clothes rental. Available on either check in day or check out day. Please designate the day when you make a reservation. -After dress up at waso koubo【miyabi】, clothes and luggage will deliver to the hotel for free. (Till 14:30 in, deliver to hotel around 15:00. Till 18:00 in, deliver to hotel around 19:00) However, recommend to leave big suitcase and valuables at cotoha HOTEL in advance. ・Perform on the day check out: Leave your luggage at waso koubo 【miyabi】and please return your Kimono there by 18:00. Taking photos in the hotel lobby is available however can’t use room after check out. ・Reservation・Cancellation・Change will accept on the day before by15:00. For cancellation, once you confirmed it, you have to make a new reservation again. ・For convenience of partner store, it may takes time to reply. Please acknowledge it beforehand.